Partly due to my uncontrollable penchant for Matt Damon, I enjoyed this movie and only fell asleep for about 5 minutes instead of my usual 15. But don't get me wrong – I have a habit of drifting off at the cinema so it's no reflection on the quality of the film. The story revolves around the build-up to the 1995 Rugby World Cup, which was held in South Africa and is a bit of a touchy subject for New Zealanders. But the film is not about why New Zealand suffered a loss in the final. It is about Nelson Mandela and how he influenced the the South African team to benefit the delicate political situation that the country was in at the time (shortly after apartheid was abolished). Throughout the course of the film the viewer is reminded about Mandela's incredible strength of character, and what the impact of his actions was on his country. If you can read between the lines then you'll know to expect some level of cheese and feel-good comedy but it's decidedly jovial and not heavy. 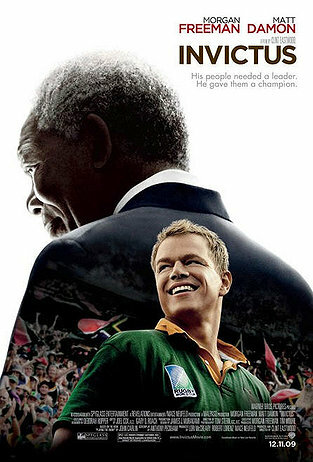 Morgan Freeman as Mandela is very good apart from a slightly confused mix of accents at times, but of course, Matt Damon as Francois Pienaar (Springboks Captain) lit up my evening like stars on a cloudless night in the countryside. I wouldn't say it's his best work, but with a face and body like that, who am I to critique. PS: If you don't know why the film is called Invictus, click here. Invictus poster image found on Flixter.com here. That’s not Matt Damon! That is Nick! What is he doing there?? ?